The Hall of the Dead is a large building in Markarth where the corpses of the deceased are laid to rest. 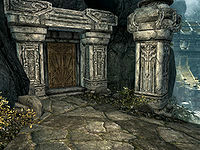 There are two entrances to Markarth's Hall of the Dead. The first is found near the entrance to the Hag's Cure and the Markarth Ruins. The second is found inside Understone Keep next to Calcelmo. The Hall is home to Brother Verulus and the starting point of the quest The Taste of Death. It consists of one area, Hall of the Dead. * Moves to Reachcliff Cave after the related quest. There is very little within the hall, to the west of the shrine is a barrel, two bottles of alto wine, a cheese wedge and a sample of wheat. To the east of the shrine is the skill book 2920, Rain's Hand, v4 above an owned bed. You are required to pick either adept-level locked doors to enter without the key. The key is given to you by Brother Verulus during the related quest. There is a secret room in the Hall. It can be seen on the map to the left of the altar of Arkay, if you stick to the wall.